Remember, although we have a great legal team working at Enom, none of what we share here can or should be taken as legal advice. Among the world’s leading registrars, Tucows, our parent company, is the only one that has redacted all personal data from the public Whois and announced a data use consent management process for registrants worldwide. In making these changes, we’ve disrupted the status quo and encountered resistance from other industry members who would prefer a more conservative solution. But with our nearly two decades’ experience operating as an accredited domain registrar and supporting a large reseller network, we’ve learned that it is imperative to choose proactive solutions and remain focused on how the industry will develop long-term, rather than default to the most simple or convenient option. The GDPR has received a lot of attention not because it’s the only law of its kind, but because of its wide scope of applicability and, perhaps first and foremost, the severity of the penalties for non-compliance. There are other, less well-known laws in countries outside of the EU that establish similar data privacy protections. We’ve looked at a few important examples—Canada’s PIPEDA, California’s new Consumer Privacy Act of 2018, and the 2000 Argentina Personal Data Protection Act—to see how they stack up against the GDPR. 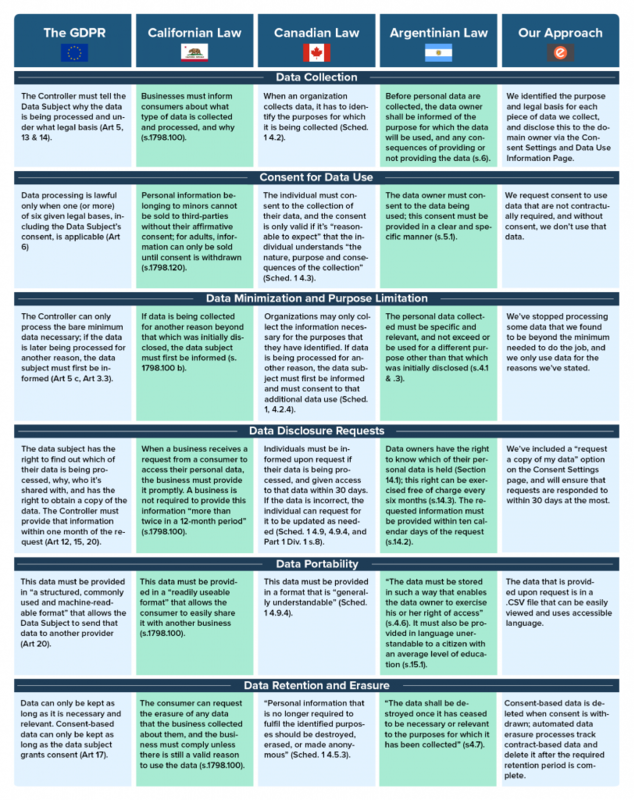 You can jump to our summary table, which compares their fundamental concepts and relates them back to Enom’s data-processing practices, or continue on below for a high-level overview of each law. We could have applied our GDPR processes to EU-locals only, allowing resellers who don’t offer services to clients in the EU to proceed with business as usual, unconcerned with the GDPR. But that solution would not only have put our resellers and us at risk of improperly processing the personal data of EU-local individuals, it was also not a viable long-term option. Data privacy standards around the world are evolving and not in a direction that supports the unnecessary collection of personal data or the continued display of unredacted personal data in the public Whois directory without the data subject’s clear and specific consent. If the laws we reviewed today are any indication of where things are headed, Enom and our reseller partners can feel confident that our GDPR implementation work has positioned us all to meet and adapt to changing data privacy requirements.